I like the way Samsung keeps its brands really separate – a totally new brand name for its Windows tablets, irrespective of the fact that Galaxy is as popular as the iPad brand name these days. Well, let us just hope the latest Series 7 Slate from the Korean can propel the series really high. Having said that, I found the 11.6” Series 7 slate impressive from what I have been hearing till now. The panel has a very good resolution of 1366 x 768 pixels plus a 400nits brightness level should make your browsing “visible” even under bright sun. Other specs include a 1.6GHz Core i5 2467M processor, integrated graphics card, 4GB RAM, up to 128GB SSD, 3MP primary along with a 2MP front camera plus Wi-Fi 802.11 b/g/n, USB 2.0 port, micro HDMI, and a 3G SIM slot. The display is glossy, so look out for those fingerprints! It looks bright and sharp thanks to the brightness level and high resolution. From the look of the front, Samsung wants you to primarily hold this in a landscape position. While holding it accordingly, look at your left side and you’ll find the mic and headphone jacks, the mini HDMI, volume rocker and a USB port. The right side has a SIM slot and a power button among others. On the top is the microSD slot and the dock connector is in its usual place at the bottom. The back of this thing baths in a nice grey brushed metal look. Engadget agrees that the body has a smooth and pricey feeling. At 890gm, it is also lighter than most of your Ultraportables. Look inside and you will find an ultra-low voltage Core i5 2467M processor that runs at a clock speed of 1.6GHz. Fret not; because you can Turbo boost this baby up to 2.3GHz with the latest Turbo Boost 2.0 technology. Due to HyperThreading support, the i5-2467M is able to handle 4 threads in parallel. There comes an integrated graphics card and 4GB of RAM. You can choose between a 64GB SSD and a 128GB SSD model – each having two variants according to the Windows version. Samsung promises up to 7 hours of play on one charge. We will have wait till we get the review unit to check that. But a low TDP of 17W on the processor’s (along with the GPU) part should help this battery life. Expecting a 10hr plus battery life from a Core i5 Windows 7 machine is not practical at this point. Windows 7 has always been bogged down by the community for not being a touch optimized platform. Samsung does not promise to overcome that with this Slate – instead they have made ready a digital pen, a wireless keyboard and a dock station for you. These will be optional and getting all the goodies together will set you back by an additional 250 bucks. $250 is expensive but to use a tablet as a productivity tool, you will need these ultimately. The 64GB SSD variants with Home Premium will go for $1,099 and with the Pro 64bit for $1,199, while both the 128GB models come with Home Premium or Pro 64bit for $1349 (?). 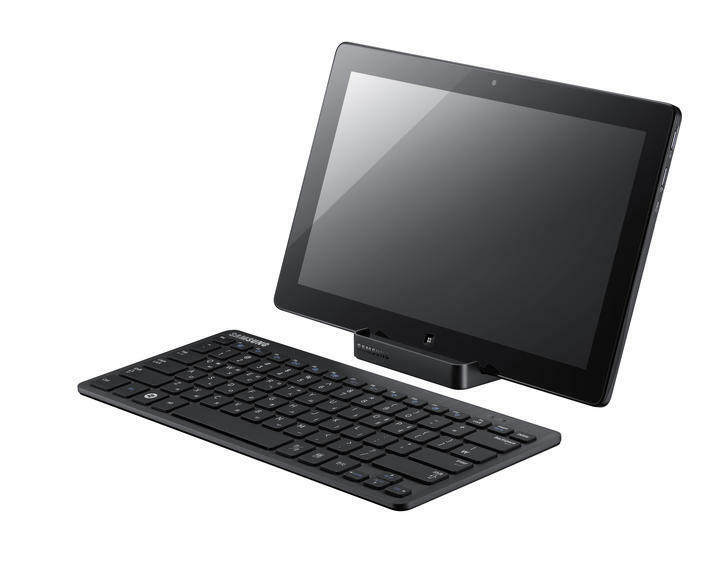 Add another $250 for the goodies including the stylus, Bluetooth keyboard and docking station. Engadget says the Series 7 Slate will be available by late September, whereas PCMag gives a date a week later. Whenever it comes, go grab it if you ever wanted a decent Windows tablet, and have the moolah.